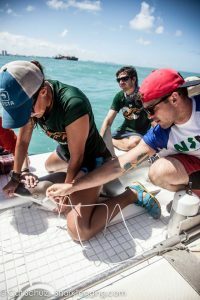 Last Sunday we had a fin-tastic trip with Riviera High, wherein we were fortunate enough to come across three unique species of sharks just a couple miles off of South Miami Beach – including a breathtaking 4-meter great hammerhead. This was our first secondary-school trip of fall 2015, and we were excited to get the students involved! When we set off in the morning, conditions were perfect for fishing offshore in deeper waters. The water was relatively calm, and the current not too strong. This meant we were able to head ‘offshore’ into deeper waters – around 80-100 ft.
Riviera High were fantastic participants today, eager to jump in and help us to deploy the first series of ten drumlines. During the 1-hour soak-time, we explained how we work up the sharks we manage to catch. The students are able to help us out with gathering a lot of this valuable data that goes toward the >10 projects our lab is working on. The students also helped us measure environmental data, namely temperature, dissolved oxygen, and salinity, which can help us study sharks’ preferred environments, and how their physiology might be affected by changing temperatures, for example. The first 10 lines, and the next set after that, proved to be lamentably lacking in sharks. One can never lose hope, however, and we were treated to a beautiful sandbar shark on the very first drumline of set #3! These sharks are lovely intelligent animals, and always exciting to encounter and work with. The students helped us to take measurements and tag the shark before we released the animal back into the ocean. Not long after this sandbar shark’s departure, the veritable highlight of the day arrived. 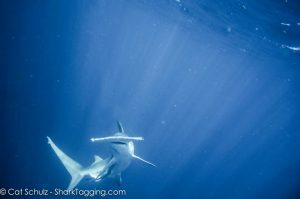 After a tellingly tough-to-pull line, we were all amazed to see an amazing, massive great hammerhead shark at the surface. Our talented team secured the shark off the edge of the platform, and we were able to take measurements from this staggering individual. We estimated the length at 13 feet, or 4 meters, and as you can see, this individual had excellent condition (basically, fatter shark = better condition), so this was very encouraging to see! Even though great hammerheads are listed as Endangered by the International Union for the Conservation of Nature (IUCN), not much is known about why they go where they do, and how fishers can best avoid interacting with them, so the more we can learn the more we can learn to progress their protection. Luckily for us, there was more to come in the shape of a very impressive nurse shark – this animal took a crack team of RJD team members to secure for the work up. This species is really quite effective at conserving energy by remaining rather placid until we take it on board for the work up. The nurse shark practices ‘bucchal pumping’ which means it can pump water over its gills without needing to move forward (like ‘ram ventilating’ shark species) – which also means we don’t need to put a pump its mouth while we measure, tag, and take samples. At the end of this back-loaded day we were thrilled by the sharks we encountered, and very excited to have captured data from these magnificent animals. 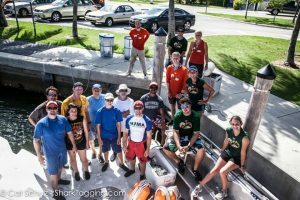 As the fall season progresses, it will be great to work with more fantastic groups, and learn more about the sharks in our area! On Saturday morning I headed over to Crandon Marina. As I drove down the causeway, the weather promised a great day with not a cloud in the sky. Our guests for the day were a brand new group, Empowered Youth, and several family members of graduating interns. With our gear loaded onto the boat and everyone excited for tagging we headed out to the Belzona wreck. On the trip out, Jake explained what we would be doing and how our guests would be helping us with our research. We set our lines east of the wreck. Initially, some of our guests were a bit shy, but with a little encouragement they were soon pulling lines alongside us. After letting the lines soak for an hour, we returned to pull lines. Early on in the day we caught our first shark. As line 3 was pulled up, something tugged on the line. 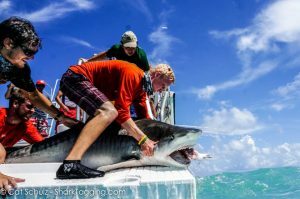 With a shout of “Shark on!” the boat became a flurry of activity as the RJD team prepared to bring the shark to the boat. As the line was pulled in we predicted what we caught, the consensus being a nurse shark. We were pleasantly surprised when a 204 cm (~6.6 ft) sandbar shark came to the surface. The students were prepared as they helped us work up the shark, bursting with excitement as they got to feel the sandpaper like skin of the shark and take measurements. Any fear of the shark disappeared as the shark remained calm during the whole procedure. Moments like these just highlight how important it is to give people first hand experience with sharks to help dispel the stigma against them. After the quick workup the shark was released, swimming down into the ocean until we could no longer see it. The first shark set the tone for the day as our guest’s infectious enthusiasm grew. More sharks were soon to follow as we caught four more sharks, all in the same set. Our second shark was a nurse, followed by a blacktip. At only 126 cm (~4.1ft) it was one of the smallest sharks I’d seen while working on the boat! After that we caught two more nurse sharks. One popped off the hook just before we managed to get it onto the platform while the last nurse was a whopping 258 cm (~8.4 feet)! We continued to pull and set 20 more lines but we didn’t catch any more sharks that day. Even so, our guests remained enthusiastic, asking questions and pulling up drumlines like pros. While we caught no more sharks on our drumlines we managed to see a sea turtle resting at the surface. An unexpected treat, a sea turtle! In all this was a great trip with a wonderful group. Thank you to Empowered Youth for being such a great group and good luck to our graduating interns! This past Thursday and Friday, the RJD crew spent two days tagging with a group of citizen scientists. Our guests met us at the boat at 9:00 am and we set off for one of our usual spots, Safety Valve. I’d been on a trip there the previous week and we had caught a variety of sharks, so I was hopeful we would be just as lucky this week. We set out lines and Dr. Hammershlag explained to our guests how we catch sharks, work up sharks, and the research involved for each sample and measurement. After leaving our lines soak for an hour we returned to pull up the first line. Our day began with a nurse shark on line three, but before we could pull it onto the boat it got off the line. The citizen scientists were disheartened by the loss, worried that the lost nurse would be the only shark they would see. Their fears were unfounded as two lines later we caught another nurse. Over the course of the day we remained busy as we caught six more nurse sharks ranging from 2.09 m (6.86 ft) to 2.63m (8.63ft) and one bull shark that came off the line before we could bring it to the boat. With a successful day of seven nurse sharks we returned to Crandon Marina for the evening. On Friday we decided to fish closer to shore to try and find a different variety of sharks. We set our lines out along Bear Cut and RSMAS and measured water temperature, dissolved oxygen, and salinity while we waited for the lines to soak. All conditions seemed to be in our favor as the very first line we pulled up wriggled with the weight of a shark. As the line reeled in we held our breath, was it a nurse shark or something else? As the fin broke the surface we had our answer, a bull shark! Jake Jerome and Dr. Hammershlag pulled the 2.19m (7.2ft) female onto the boat. We did our usual workup on the shark before Neil implanted an acoustic tag under her skin. The tag will be used for the Urban Shark Project, a study on sharks in urbanized environments. After returning her to the water we continued to pull lines. We didn’t come across anything until line 15. We pulled up another female bull, this one larger than any bull shark I had seen before, 2.9m (9.5ft). After the workup she was fitted with a SPOT tag and released. As we pulled lines that day we could see people swimming and paddle boarders paddling. The fact that both the sharks and beach goers were coexisting in the same area really brought home he fact that humans aren’t on sharks’ menu. In two days we caught seven nurse and two bull sharks, quite the successful trip. Thank you to our citizen scientists for joining us on this trip. I’m sure they had as much fun as we did! This trip couldn’t have come sooner. I’d been in my office for far too long and a tagging trip was long over due. Before the sun began to rise Sam and I piled into the car and headed to West Palm Beach. We met the rest of the team at Jim Abernathy’s Scuba Adventures at 7:30am and began loading up gear. With only 4 team members, I knew today would be a busy one. When our guests, Gulliver Preparatory’s Oceanography Club, arrived Dr. Neil gave everyone a briefing about shark conservation and the importance of our research before heading out. As we left the harbor the waves began to grow higher and higher, until we were in 5ft high seas. It was difficult to safely move around the boat, much less tag, so the captain suggested we set lines closer to the harbor. To a resounding yes, we headed to the intercostal area, a location we had never tagged in before. The ocean flattened out to minimal waves as we reached our location and set our lines. After we demonstrated how to set the lines, the Gulliver Prep students enthusiastically helped set the first 10 lines of the day. We headed back in to pick up a guest photographer and Dr. Neil demonstrated how to work up a shark and the research behind each sample. After letting the lines soak for an hour, we headed back out to pull in lines. As the first line was pulled in, no one expected anything to be on it since we rarely catch a shark on the first line. To our surprise the line was taut and a 216cm (~7ft) male nurse shark came to the surface! The deck was a flurry of activity as we brought the shark on to the boat, everyone excitedly chattering about such a lucky find. We worked up the shark in a few minutes and released it back into the water in good condition. Nurse shark being worked up Caption: Gulliver Prep student helping the RJD team work up a nurse shark. The first shark put us in high spirits, and we continued to pull in lines. On the 9th line we caught another male nurse shark, this one smaller at 186cm (~6 ft). After working up the second shark we continued to pull up lines, but didn’t see anything until the 18th line. As the line was pulled in, Jake said that something was on the line but it didn’t feel big enough to be a shark. As it reached the surface we got our answer: a gafftopsail catfish! The hook was quickly removed and the catfish was returned to the water, but not before getting slime on everything it touched! In total we caught two male nurse sharks. We rarely find so many male nurse sharks in one trip! Hopefully the data we collected can help us figure out why they were there. Over all it was great day out on the water. I hope the Oceanography Club From Gulliver Prep had as much fun as we did! Thanks for a great day on the water Gulliver Prep! Last Friday was a great day of shark tagging. Not only did the RJD team get to spend the day with the fabulous students and teachers from SLAM academy, but the day was documented by a CBS film crew! A great day with great people. The RJD team met at Crandon Marina at 8 am to begin loading up “Divers Paradise”. It was beautiful out and we knew it was going to be a great day. Once SLAM and the CBS crew showed up, the RJD team introduced themselves and Dr. Neil gave everyone a briefing. Since it was such a gorgeous day and the water was quite calm we decided to head offshore to a deep reef. Once we got to the site we quickly set 10 drumlines, took some environmental data, and had some lunch while we let the lines soak. After the hour-long soak we began checking our lines. When we got to line 3 we felt a familiar tug on the line and the team got ready for action. As we pulled in the line we determined we had caught a feisty female nurse shark that was approximately 250 cm long! Unfortunately, as we brought her in she managed to slip the hook and swim away. While it’s always a bit disappointing when a shark slips the hook it was great to see such a strong and healthy animal. We continued checking and rebaiting the lines but the next 14 lines came up empty. However, something was eating our bait and we knew it was only a matter of time until we caught another shark. By line 18 the action picked up again when we caught another 251 cm long female nurse shark. The RJD team secured her while the students went to work collecting data. Within a few minutes her workup was complete and she was on her way again. Lines 20 and 22 also came with their own ~250 cm female nurse sharks! Each time a new shark was caught a different group of students came to the platform to help the RJD team collect data. In the end it was a very interesting day because all 4 of the sharks we caught were ~250 cm long female nurse sharks. Hopefully the data we collected can help us determine what they were all doing there. Thanks again SLAM, it is always a pleasure to go out with you guys. I can’t wait until the next trip! When I woke up on Saturday morning, I was incredibly excited to be going shark tagging. I had been looking forward to this trip all week, and I saw that the weather was going to be perfect. It was going to be sunny and high 70s to 80s all day. I grabbed all of my gear and headed to Diver’s Paradise at Crandon Marina. The RJ Dunlap team arrived at Diver’s Paradise around 8am to load the rest of the gear onto the boat. We were all ready for a great day of tagging with a great group. The group from Big Brothers Big Sisters arrived soon after and they were all very excited to be going shark tagging with us today. We added extension lines, since the weather was good enough to go to a deeper site. Captain Eric gave a safety briefing followed by Dani, who gave an explanation of our drumline system. We were all filled with anticipation going out the site, which was just off of Miami Beach. The group came to the back of the boat to see how we deploy the lines. Then they helped us deploy the rest of the first set of ten lines. Everyone was very enthusiastic and so helpful. The first ten lines went out smoothly. We then let the lines soak for an hour. Our first shark was a large nurse shark. I think it may have been the biggest nurse shark I have ever seen. We quickly brought the large animal up onto the platform and did the work up. Everyone got a chance to touch the shark, which has very different skin than most sharks. Our next shark was a sandbar, which was extremely active on the platform. We did the workup in less than five minutes and the shark was put back into the ocean in excellent condition. After these two sharks we got data on another two nurse sharks and another sandbar shark. All of the workups were done quickly, and everyone on the boat had an opportunity to help with at least one aspect of the work up. We had a great day, with a lot of important data collected. I hope that the group from Big Brothers Big Sisters had as amazing as a day as I did. I enjoy every trip that I go on and appreciate all the opportunities that I have to help aid in the conservation of these incredible animals. Group picture, back on the dock! Waking up on Sunday morning, I was extremely excited to be going shark tagging, since it was my first trip in a few months. I got up, checked the weather, it said less than 60 degrees. I was very surprised, doned my sweatpants and sweatshirt, and set off to Diver’s Paradise at Crandon Marina. We arrived at Diver’s Paradise around 8am and loaded the gear onto the boat. Despite the fact that we were freezing, we were all anticipating a great day of shark tagging. The group from Our Lady of Lourdes Academy arrived around 9am. Captain Nick gave a quick safety briefing followed by an explanation of our drumline system by trip leaders Dani and Jake. We had added extension lines because we were going to go to a deeper site. Dani cuts up bait on the way out to the site. The girls and teachers were all very excited while we headed out to the site. Once we got the site, the captain made the decision that it was too choppy to shark tag there. Instead of the deep site, we went to Stiltsville instead. The team quickly took the extension lines off, and prepared the first several lines to go out. After about another half an hour, we suddenly felt the boat start to slow and we saw the famous houses at Stiltsville. The team gathered the students near the back of the boat to demonstrate how we were going to deploy the lines. After the first line, the students were given the opportunity to deploy some lines. The students were organized into groups, which made the whole process run very smoothly. Our first shark was a gorgeous blacktip. We swiftly brought the animal up onto the boat and did the work up. With the help of the students, the shark was back in the water within five minutes. Our next shark was a small nurse shark, which wriggled its way off of the line. We then worked up a blacknose followed by a beautiful 230cm lemon shark. This was only the second lemon shark I have ever seen. They have such distinctive teeth and I was in awe at the splendor of this animal. After the lemon shark we were able to work up another blacktip, blacknose, and a sizeable nurse. All of the sharks were worked up quickly with the help of the students and teachers. We had a great, busy day seeing a lot of variety of shark species. Every trip that I go on is different and every trip gives me the reminder that I am so lucky to have these opportunities. I hope that the students and teachers had as great of a day as I did and are now encouraged to go out and do more conservation work. Group picture back on the dock. We enjoyed yet another beautiful day of shark tagging. The RJ Dunlap team had the pleasure of taking out the 360 Destinations group. Since the group was rather large, we had the added excitement of sending out two boats, in tandem. Spirits were high as everyone assembled at the Crandon Park as it was a gorgeous day. Plus, there was some playful jesting between the two crews over who would see more sharks. The competition would be fierce! Today’s destination for both boats was Soldier Key, a brisk 30 minute boat ride away. As we were preparing to depart the marina, we were met with a pleasant surprise. A friendly manatee graced us with its presence in order to get a drink of freshwater from the dock hose. Our sirenian friend was a great preface to a fun day, and saw us off to Soldier Key. In route to Soldier Key our enthusiastic guests were given a rundown on the kind of research our program conducts. They were excited to know that they would be assisting in collecting real data that actively works toward the education and conservation of shark species. Everyone was engaging and friendly and showed a true interest in the work our team does. It was a treat getting to know some of our guests. I even met a fellow Chicago native (Go Blackhawks!). Upon our arrival at our fishing spot, both boats spread out and deployed our respective drum lines. Of course, the helpful guests of 360 Destinations assisted us in deploying our lines. I was impressed with their willingness to assent to our very serious superstition of kissing the bait before deployment. Anyways, they were intrigued to interact with our specialty gear and learn how our drum line system allows us to safely catch and release sharks with the animal’s health in mind. Once our 10 lines were in the water, we allowed them to soak for an hour. This gave us the opportunity to demonstrate the process involved with working up a shark once we catch one. We displayed all of the tools we would be using and explained what kind of samples are collected (e.g. nictitating membrane, measurements, fin clip, blood). We also showed them how we insert our tags into the dorsal fin. It was great to see the whole group getting involved by asking questions and getting a good look at all of our gear. Our trainees were well prepared. Once the obligatory soak time was up, we headed towards our first line. We demonstrated the proper form in pulling up lines, and then let our excited guests take have a try. Unfortunately, our first set of lines did not hook anything. Although, we were still having a great time on the water in beautiful weather. We had been in communication with our other boat that was out, and they informed us that on their first set they were lucky enough to catch a nurse shark. The pressure was really on now! So, we put new baits on our lines in hopes of better luck on the next set. We returned to our lines for our second (and final) set of lines. We had 10 more chances left. It was a slow start. Our first five, again, rendered nothing. We pulled up these lines and stowed them away for the day. Finally, the moment everyone was waiting for came on our sixth line. Like the other boat, we caught an amazing nurse shark. Its total length was about 2.3 meters, and she was feisty until we carefully restrained her. Everyone from 360 Destinations was standing by and ready with their instruments. They did a fantastic job, and helped us to collect each sample without error. It was a successful workup, we safely released the nurse shark in a timely fashion. It was a great experience for everyone involved, crew and guests. We retrieved the rest of our lines and returned to the marina. Over the course of the afternoon, each of our boats caught a nurse shark. That is two new sets of data RJ Dunlap can use in our research. Also, it is two rare opportunities for people to safely interact with two amazing animals. We should all feel fortunate that to have had such an experience. Thanks to all the 360 Destinations guests. RJD had a great day on the water with everyone, and we hope you a memorable time. After collecting gear from RSMAS I met up with the rest of the team at the dock of divers paradise. We had a great crew on board and everyone was excited to get out there. Our guests for the day, the marine biology club from St. Thomas Aquinas High School, made their way on board, and after introductions we were off. We were fishing in the Key Biscayne Safety Valve right near Stiltsville. RJD had been to this sight a few times in the days before and had great luck so I was feeling optimistic. As I was pulling in a line toward the end of the first set I felt a little tug but not much; I assumed it was just a big piece of bait. As I continued to pull the line up I felt a number of tiny tugs, but still just passed it off as a big chunk of barracuda. After I had almost the whole line in I realized it indeed not just bait on the end of the line but an Atlantic Sharpnose. These sharks are one of the smaller species we catch, rarely reaching a total length much greater than 1 meter. Our team brought the shark on board for a quick work up. The students from St. Thomas Aquinas did a great job assisting in the process and the shark was back in the water in no time. Not shortly after, as we were approaching one of our drumlines Captain Eric called down to the deck “shark on.” From up top he could see the beautiful Great Hammerhead we had on this line before we even started to pull it in. Knowing that hammerheads are especially vulnerable to capture stress I pulled the line in swiftly. We assessed the condition of the shark and after confirming it was doing well the team restrained it along the side of the boat. We attached a satellite tag to the animal and released it as quickly as possible. The shark swam away with no sign of stress, kicking hard back on its way. I am excited to watch where this beautiful shark travels through the satellite tracking data. The RJD team carefully attaches a satellite tag to the great hammerhead. Before the day was over we brought up one more shark, an RJD favorite, the nurse. Despite common belief, nurse sharks are very powerful and always give us a run for our money. The team brought the shark onto the platform for a quick work up. After collecting all of our data we released the shark in excellent condition. All in all, we had a great day on the water with Captain Eric from Diver’s Paradise and the Marine Biology club from St. Thomas Aquinas. I’m already looking forward to the next trip! Thanks for a great day on the water St. Thomas Aquinas! Our chartered boat, the Diver’s Paradise, headed out under sunny skies early Friday, July 11th with a volunteer crew of Rutgers graduate students. There was a slight swell to the ocean, but given the stormy weather earlier in the week we were happy to be out on the water no matter the conditions. The boat was headed to a tagging location nicknamed Sandbar Palace by one of the RJ Dunlap interns. Located within sight of Miami Beach, this spot acquired the name due to a large number of sandbar sharks caught there on a recent trip. After pulling in two empty lines, the third drum line was pulled in to a call of “tension” by a Rutger’s volunteer. We had something. As we pulled it in, Captain Eric spotted the large, sickle shaped dorsal fin of a hammerhead from the upper deck. We brought it alongside the boat, completed a speedy partial workup and released the large female in just a few minutes. An estimated measurement put her at 308 cm, around ten feet long. Five of the next seven hooks were empty; the other two held nurse sharks. Because the nurse sharks are not nearly as prone to stress as hammerheads, the crew and volunteers worked together to do a full workup including measurements, a fin clip and a blood sample. The hammerhead swimming away in great condition. The first line of the second set of ten held a lemon shark that was nearly three meters long. The feisty male latched on to the platform as we pulled him in and refused to let go for a minute or two. He was immediately followed by a nurse shark on the next line. The last drum line of that set held a beautiful female sandbar. Her skin shone with a faint iridescence, much like the inside of some seashells. For someone who had never seen one before, it was breathtaking. A Rutgers student tests the stress levels of a sandbar shark. At that point, everyone on the boat was pretty happy. With ten lines to go we had already caught six sharks of four different species and the day was far from over. Lines three and four held nurse sharks, and line six another lemon, but it was the seventh line that held the most exciting catch, a tiger shark. At 2.5 meters, it was quite small (tiger sharks can reach lengths more than double that), but it still managed to put up quite a fight both being reeled in and on the platform. The two empty hooks after the tiger shark were met with relief as the crew took advantage of the opportunity to rest. Finally, on the last line of the day, we caught another sandbar, bringing our total shark count for the trip up to one hammerhead, five nurse sharks, two lemon sharks, a tiger shark and two sandbar sharks. It was a very successful day. The tiger shark’s release back into the ocean.